A very early Saturday morning start so grateful Kelly suggested staying at the Gatwick Sofitel the night before a new adventure. Kelly in high spirits playing ‘splat the dots’ at the departure gate! My friend Kelly and I are both flying business class for £50 courtesy of a British Airways companion voucher. So as you can imagine it’d be rude not to start our trip by tucking into a little bottle of champagne for the flight. OK so it was an early start but we added some orange juice so it’s a Bucks Fizz, sort of breakfast drink, right? Our early start at this end did however mean that we arrived nice and early into Dubrovnik ready to check into the hotel, leave our bags and head out to explore everything that Dubrovnik offered. 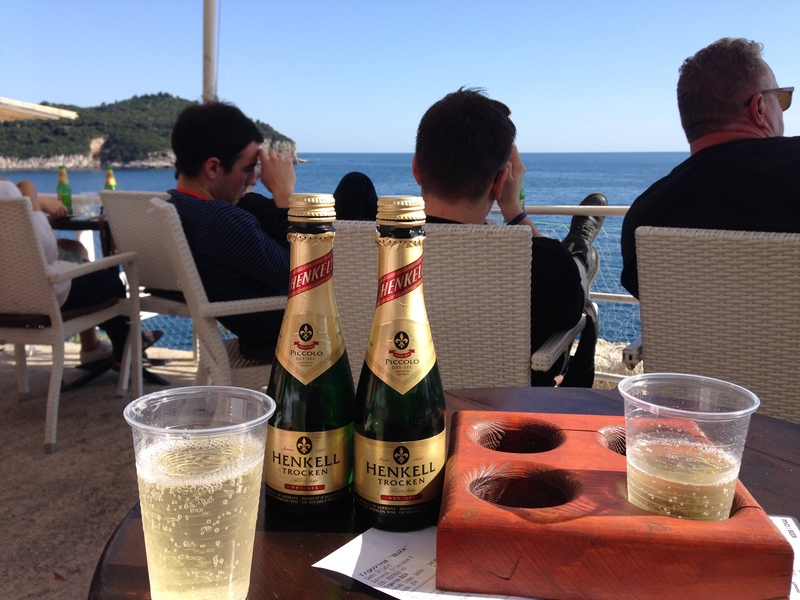 What we hadn’t realised was that this weekend Dubrovnik was under siege… from 35,000 Catholic Youth! Our quick arrival was therefore not as easy as we’d hoped as no taxis were allowed anywhere near the City and we had to do a rounded diversion to our hotel. Not too much of a drama and we were grateful that we’d not booked something in town or otherwise we would have been schlepping our bags for miles on foot to check in. Our hotel was the Rixos Dubrovnik. Yes, of course, we managed to get a good deal for our twin room with balcony overlooking the ocean… The hotel is huge and I’m not sure we’d have loved it as much if we were there during the summer season! But perfect for this weekend. A wonderful extensive buffet breakfast and Wifi included. Approximately 15 minute walk to the City Walls but not for the fainthearted as it is up and down some hills (but no steps!). The clouds are looming when we check in and shortly after we’ve done so, the rains start. A hot chocolate on the balcony bar upstairs whilst we regroup and decide what to do. Chatting to a fellow traveller who’d been there for a week, she tells us that nothing is open in the CIty today because of the ‘Youth’… oh joy! But we’re here to explore so decide to talk a walk down to the City to get our bearings and work out a plan of action and where everything is for tomorrow…. surely something must be open? What we hadn’t quite thought through was that as we decided to venture down the main hill to Pile (the City Walls) and a walk that should take us 15 minutes in total, 32,500 Youth are walking up the hill toward us. You’d think they’d spot me in my fluorescent rain jacket but clearly not – I know this particularly by the amount of umbrella spokes in my face and bumps from teams of people coming toward me. Hey ho, it’s all an adventure. The walk however takes well over an hour and even when we finally make it to the City Gates at Pile we’re told by the police that noone can enter until the ‘youth’ have all left. Fortunately at that point we notice a restaurant (Posat) is open and that it has the perfect view of the City Gates so we’ll be able to assess the situation but with a hot drink and a local cake. Whilst we had arrived from the UK travelling light and a little unprepared for the weather, we’d known the forecast had been rain. How come the Croatian Catholic Youth hadn’t realised it’d be a rainy day? We noted that they were all dressed in the uniform Converse canvas shoes which were no sopping wet and no waterproof jackets (or one or two). Really? OK so who out there knew that Croatia had such delicious wine? Seriously some of it is extraordinarily good. Our ticket officially enabled us to try 12 wines but as it was the last day and none of the winemakers were keen on taking our ‘tokens’ we sampled quite a few more! Starting with the sparkles, whites, rose, desserts and then the reds. Kelly was chief notator and her ‘tasting notes’ were smiley (or not) faces and little quotes from yours truly. 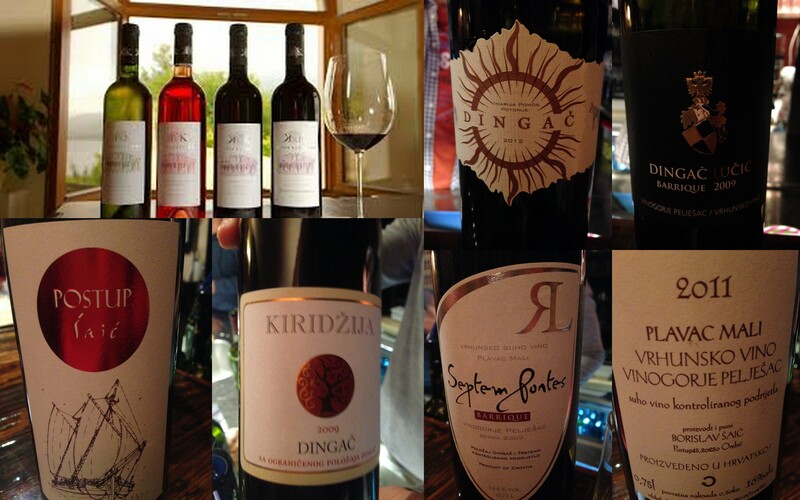 I think the best one was “QUOTE… DIRTY” Matzo Zivkusic “The red looks as young as the man serving it”; Vina Milacic 2009 “Dirty edge on a light wine”; Norris Violic dessert wine “Love but no commitment”; Volarevic Vinogradi “Pink BBQ wine”; Karajancic Vinarija “White wine with an empty finish”. Hehe I can see a career in wine reviewing! During our afternoon we spoke at length to some of the winemakers. 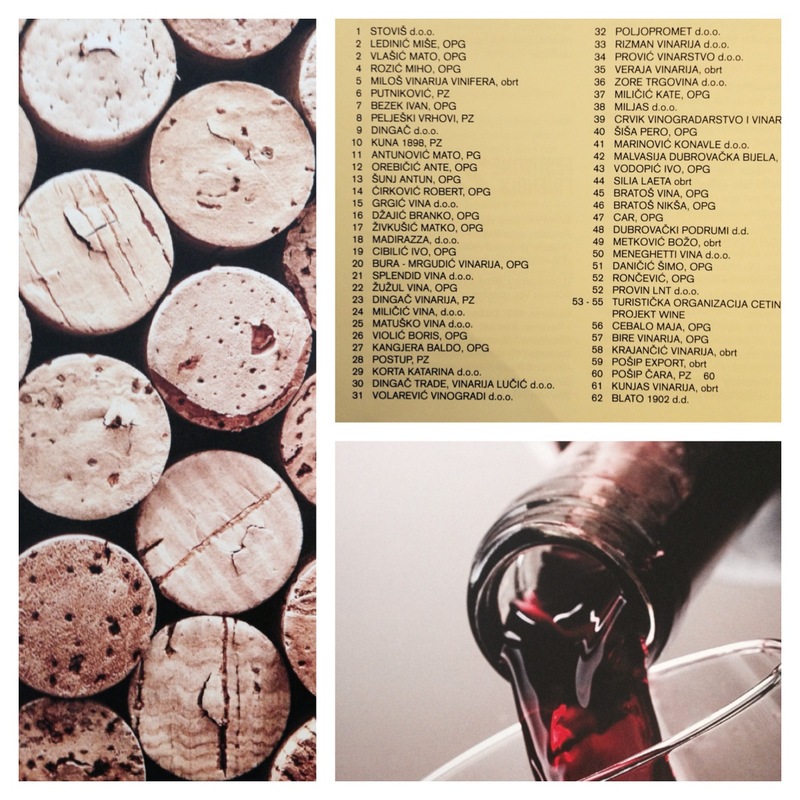 Croatia really is a relatively new commercial market but some of the vines are gloriously old. I think my favourite wines were from the winemaker Korta Katarina and Ivo Cibilic, demonstrated such passion about the wine made, the story behind it and indeed the taste of both the white, Posip and red wine, Plavic Mali, were wonderful. During our FestiWine experience we also met two chaps on holiday from the UK. David and Gino. They’d been to the FestiWine the day before and had therefore returned to try some more as well as enjoy and buy bottles of their favourites. 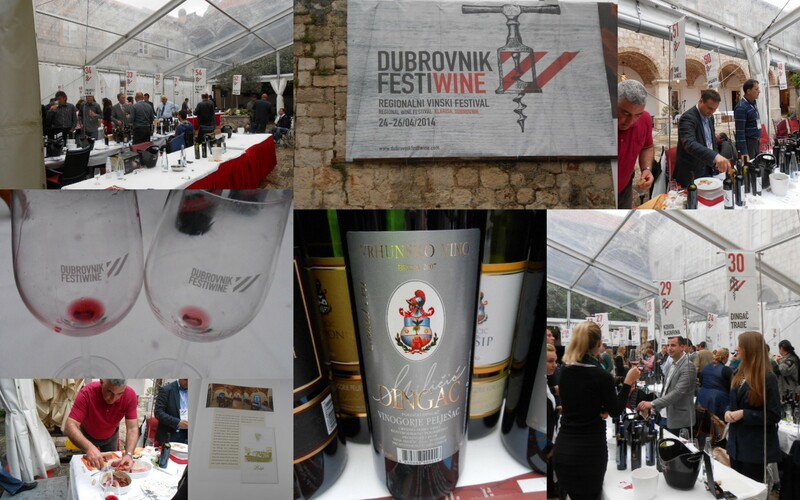 Great to chat to them and try some more wines but also find out what they’d already discovered in Dubrovnik. I ended up chatting with Darrell from Decanter Magazine.. pleased to hear that my favourite wine was also one that’s been commended more than once by Decanter and him. Some hours later and as the FestiWine drew to a close, we headed back out into the Old Town. Needless to say we might well have been a little piddled so food was most definitely in order. One piece of cake and a BA breakfast (with bubbles) clearly wasn’t enough! On the recommendation of David and Gino we located Gills restaurant (which was open) and headed upstairs to a free table. Honestly our meal was delicious (or that’s how we both remember it) but perhaps not enjoyed to the best of it’s promise due to the wine imbibed! I had some delicious tuna tartare and Kelly the sea bass. By the time we’d finished our meal, we figured we probably ought to have another sample of Croatian wine. As both the boys and others had recommended a cheeky little wine bar on the next street, we headed to D’Vino. This turned out to a top recommendation indeed. On entering D’Vino you feel as if you’ve been there before, many times. It’s home. But actually it’s better than home as it comes with experts in wine and, what seems to be, an endless supply and range of deliciousness. We took our seats at the bar and the barman, Patrick, quickly established the type of red wine that we liked and set about finding us a Croatian wine that we would love. We said that we felt we’d like to try two wines for the end of the evening… one wine and then a finisher. He so got it right for both us of and with all four wines. Whilst he thought about which wines he told us a little about each winery, winemaker, how many bottles, grapes, oaking etc etc. I love knowing a little more about what I’m drinking but the bar is also perfect little hideaway if you just want to drink a glass or two of wine in a quiet nook and peace. The owner of the bar is Sasha Lusic who’s family emigrated to Queensland in Australia to avoid the war. Sasha returned to Croatia to open this wine bar in his homeland only a few years ago. How wonderful to be able to return to his homeland and heritage and run such a successful business. I’m quite sure his parents must be so very proud and apparently have suggested moving back to Croatia to be near him. Again how enlightened to then be able to return and follow the new path that his son has created. 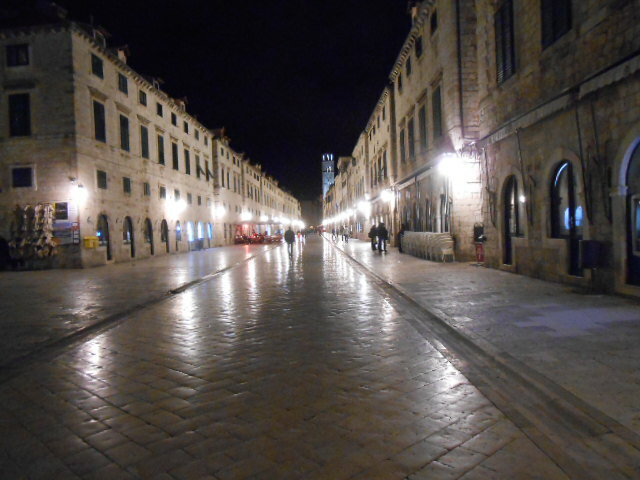 Just as it started to rain again we left the bar, walked down the alleyway back to the main pathway in the Old Town. The limestone pathway is now glistening and shining in the moonlight and rain – utterly magical. Poor Sasha, who left the bar with us to walk part of the way home to his moped had to experience our rendition of singing in the rain along the beautiful pathway… of course it was in tune and quite a spectacle (in a good way)! At the very least it bought such a smile and giggles to all three of us. Today should have been the day that I chose to wear shorts but instead I’d worn less yesterday on the basis that there was less to dry out from the rain… I think now I’m writing this up a week later that perhaps this could be why I’ve a streaming cold and cough. There were several things on our ‘to-do’ list of Dubvrovnik and two definitely required a clear vista and sunshine. Cable Car and City Wall Walk. Fortunately today it appeared (despite the gloomy weather forecast) that we would be in luck. After breakfast we headed into town with our ‘walking shoes’ firmly on. 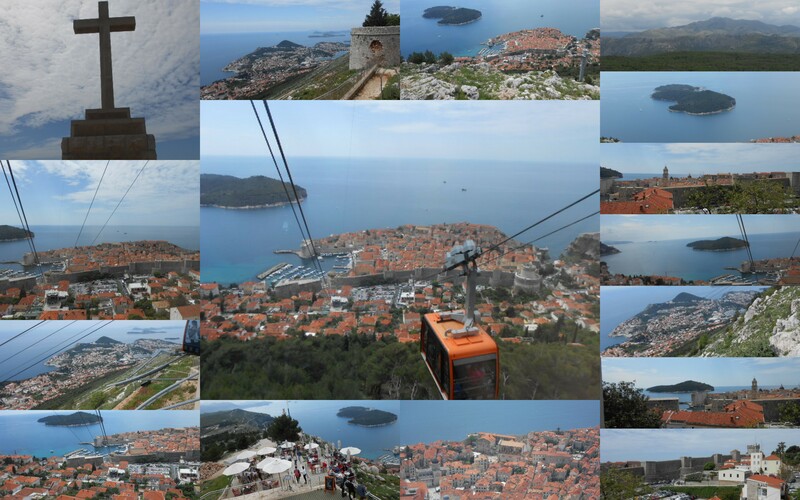 There’s no doubt at all that the cable car does give you some of the best views over Dubrvonik Old Town and the islands beyond. It certainly gives you a totally different perspective and also helps to realise that Dubrovnik truly is a small and beautifully formed City. However we learnt later that there’s a fortress at the top of the cable car but as it’s a different business entity it’s not advertised within the cable car nor is the price of entry included. What a shame we didn’t know we could visit it. The cost of the cable car is an extravagance by Croatian standards on its own at Ku100 return with the cost having risen by Ku30 since last year. If I were doing it again, I’d get a one-way ticket to the top, see the Fortress, have a snack and drink in the cafe at the top and walk back down (there are zigzag pathways the whole way down). When we returned to the City Walls, we headed for the old marina in search of some fresh calamari to share for lunch together with some water – sustenance for our next tourist adventure, Walking the City Walls. Once down we walked back on ourselves at the street level to find a little ‘secret’ bar that was cut into the rocks just outside the City Walls. What a perfect way to see the sunlight change. After a brief siesta back at our hotel we headed back down the hill to the Old Town for dinner. Once again we were working on the recommendations from people we’d met at FestiWine and headed to Proto for dinner. 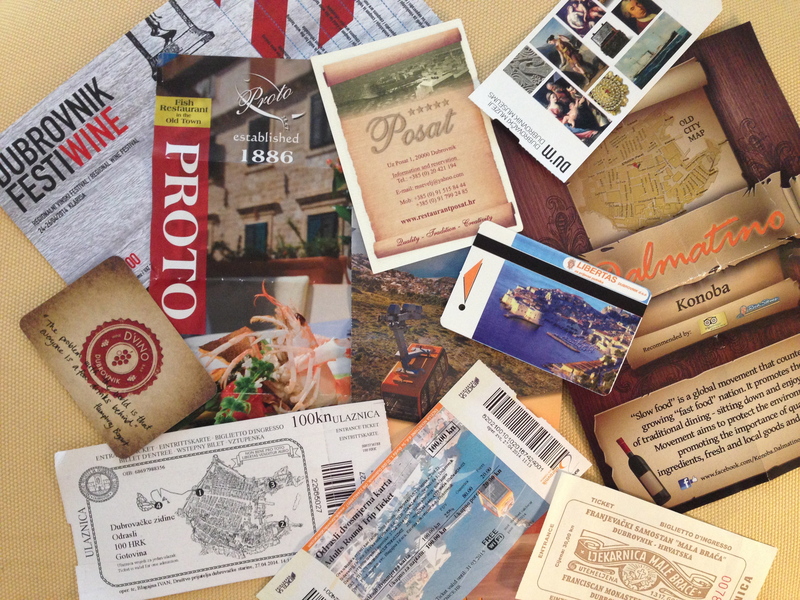 Proto was personally recommended but also appears in many reviews and guidebooks as 1st or 2nd in the list of places to eat in Dubrovnik. We both had a soup to begin with, Crab soup and Fishermans soup – these were both utterly delicious, full of flavour and absolute hits for us both. However our main meals we were good but both of us felt were lacking something to be ranked so highly – perhaps we chose badly or know that they couldn’t match up to the starters. Back to D’Vino for our ‘finishers’ before heading home. Patrick and Sasha spoilt us rotten with two more delicious wines – v happy bunnies! If you were in Dubrovnik for longer than a few days, I’d suggest hiring a car and driving away from the City. Montenegro was spoken about by others who were there for longer as was Lokrum island. 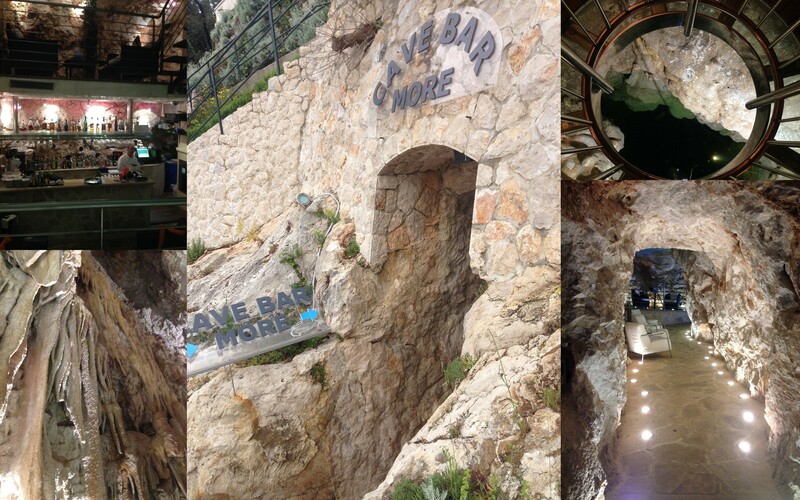 For us, on foot, we chose to walk toward Lapad and in search of the Cave Bar. A lovely walk and into an area that perhaps during the Summer would be my idea of hell. Lapad is clearly set up as a holiday resort. Big hotels with pools, little stretches of beach, karaoke bars and a strip full of restaurants and bars serving ‘English food’. Sadly there were also many many feral cats that were running around eating scraps and waiting at the feet of people eating. This was out of season. Not my idea of fun at all but each to their own. At the end of the ‘strip’ our walk took us to the beach and a oceanside pathway. Back to being stunning again. The sun was shining, the water glimmering and small islands in view. It wasn’t long until we stumbled across some steps down to some outside tables and a cave entrance. It’s (not surprisingly) closed during the winter months as it’d be a touch damp as the waves would lash into the cave entrance and no doubt full to the brim with tourists in the summer. For us, it was utter perfection – Spring sunshine and open! 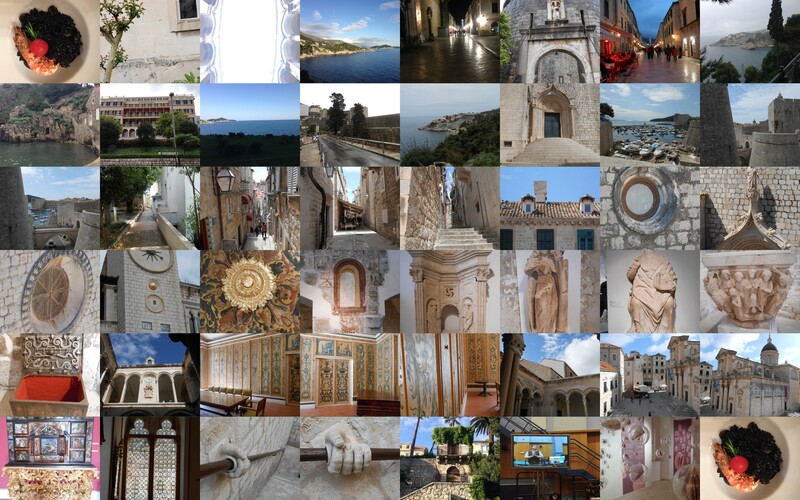 On our agenda for this afternoon we had a few museums to visit and a thirst to find out more about Dubrovnik’s history. We headed for the bus stop in Lapad to take us back to the Old City. (Amusing moment was watching 3 policemen direct traffic around a roundabout!). The bus seemed particularly expensive for a short trip and for the two of us it would, in fact, have worked out cheaper to take a taxi but hey, you live and learn. I’d been looking forward to visiting the Natural History Museum. I’d seen something about a Mollusc exhibition that looked interesting and colourful. We entered the Museum (it was free) and wandered round. Disappointingly it appeared more like a school science project with few exhibits and little information to learn or be absorbed by. Many of the ‘exhibits’ were badly put together sea creatures and more like a school class project. It was only by the time we’d climbed to the very top floor, did we see the mollusc exhibit. 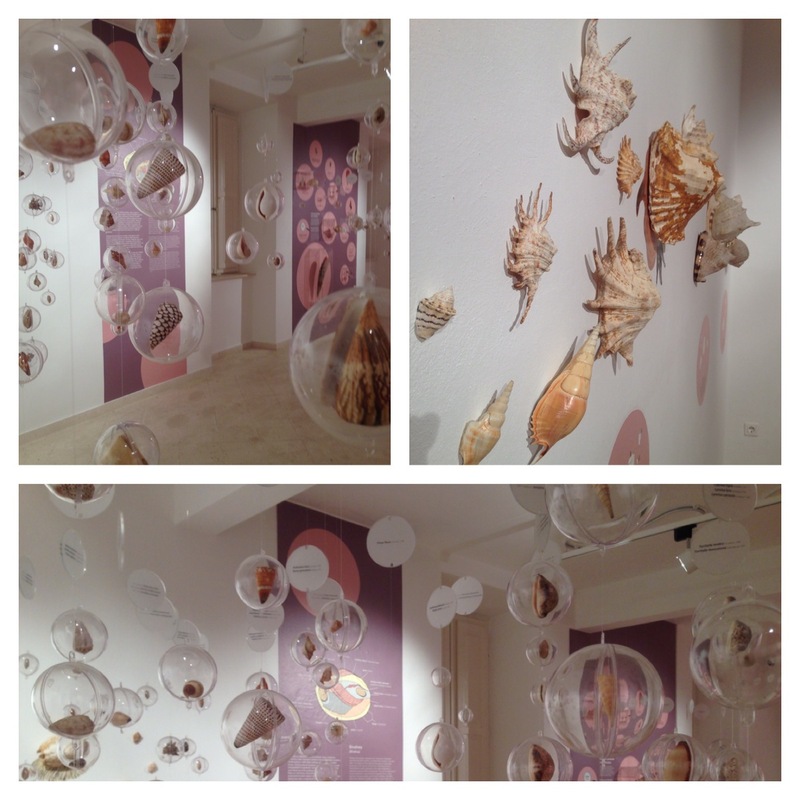 Set out in a fun way with the shells hanging from the ceiling it was visually stimulating but sadly lacked content and explanation. Time for lunch and we were in search of a good seafood risotto. Where best to go but to the Old Marina? Certainly filling and with seafood however not the black risotto we’d been expecting but did the job before we headed back into the Old City for more exploration. Our wanderings took us up and down small alleyways and pathways. There’s certainly so much more to the Old City than the tourist route. Disappointed though that an exhibit we’d hoped to see ‘War Photos’ wasn’t open until the 1st May (only a few days time). 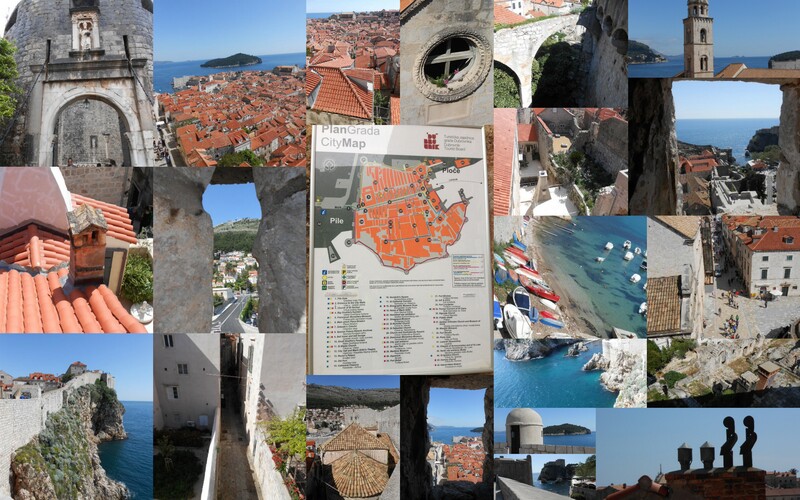 We’d both really hoped that this would give us the insight into what happened in Dubrovnik through the photos and now having seen the city from the cable car, the city walls and on foot we would be able to understand more fully what happened in the very recent history. In the evening we returned to Posat, the restaurant we’d sought refuge in on our first day. A definite foodie must. Loved this place, it’s ambiance, food, wines and, of course, views over Pile and the City Gates. After dinner we thought we’d go for a nightcap somewhere different. There’d been a jazz bar, Troubadour, that we’d spied on our wanderings. It looked wonderful. Great atmosphere created even more spectacularly by the notes of the jazz reverberating around the City Walls. However on checking our Kuna currency situation we realised that we could be in trouble if they didn’t take cards (we’d budgeted just enough for our taxi to the airport tomorrow with a few Kuna for a light lunch). So where else are two ladies to go but home… errr d’Vinos! Back to our bar stools and Sasha and Mark working. Tonight we tried yet more wines and were once again not disappointed. Our final day and we still had a few places left on our ‘to-do’ list. One being the Franciscan Monastery and Old Pharmacy. I loved the stonework here in the monastery most. I was also fascinated by the old pharmaceutical equipment. Looking back you may believe these to be fairly barbarian but actually I think them to be quite advanced. Many of them not far from the items now used but perhaps slightly cleaner! There’s still a pharmacy on the site and I was pleased to see that not only stocking ‘today’s items’ they also had some tinctures and creams made on site. 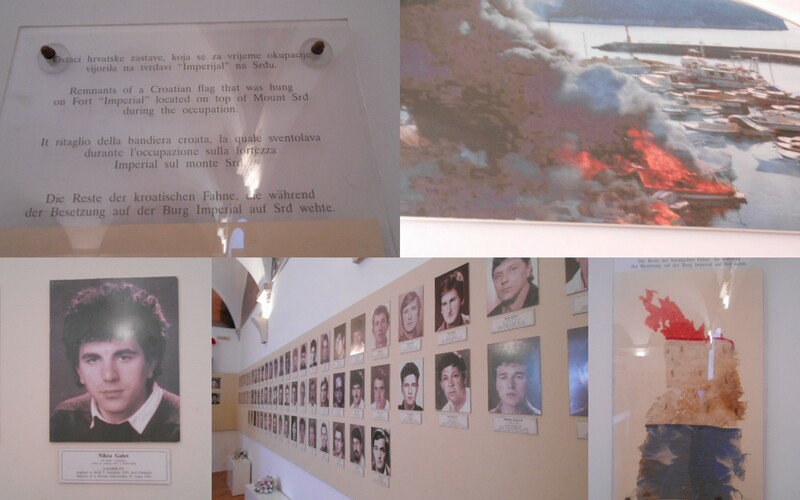 One other bonus for us in the Monastery building was a room with some photographs and history. of Dubrovnik. Just these few photographs gave us much more of an insight into what happened to this City and indeed at how recent this dreadful war was. How shocking it is to see photographs of people who have lost their lives protecting their homes – not soldiers who’ve signed up to ‘war’ – but young men who would have been sharing their birthdays with me. I think until we saw these pictures I certainly hadn’t been aware of how much of the city had been devastated and in the last 20 years rebuilt. No wonder the roof tiles in the City were so red and clean… it wasn’t a renovation project it was necessary after the devastation. Pieces of the City Walls now obvious to us as repaired and replaced by limestone and marble. And, mortar holes and gunshot wounds in the side of buildings. I just wish we’d been able to learn more about this from City itself… particularly as many of the people we’ve met would have lived through this dreadful time. 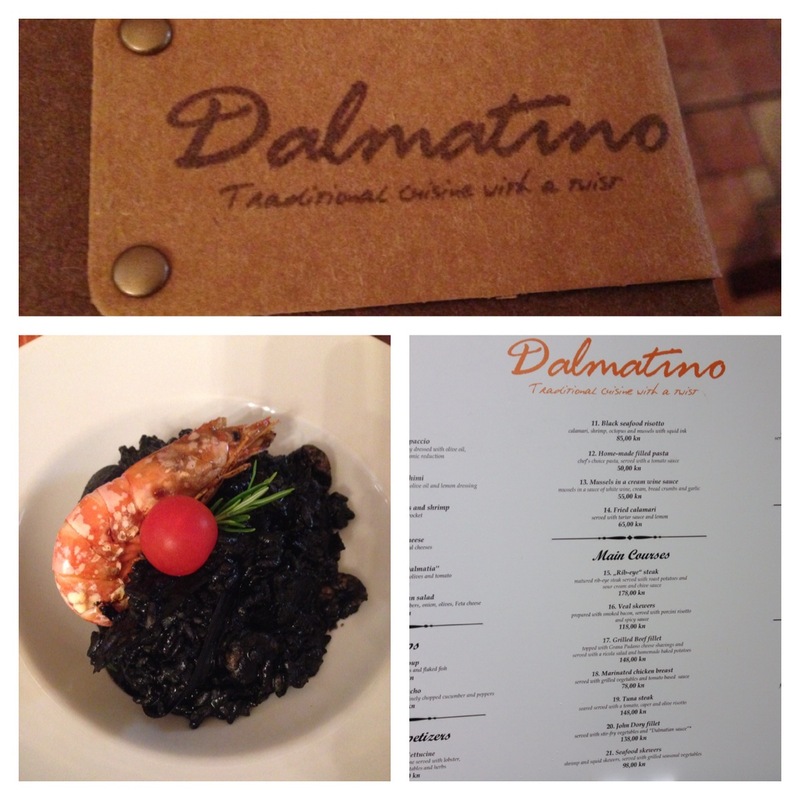 Our final meal in Dubrovnik had to be at the Dalmatino Konoba and had to be black risotto. This restaurant is hidden down an alleyway and described as being ‘authentic’ but also as having a ‘limited menu’. For us, this is the perfect description and makes it a ‘must visit’ restaurant. We weren’t disappointed and shared an utterly delicious black risotto dish of epic taste. Yes the surroundings of the restaurant are authentic but that’s what we’d like as our last meal here. Perfect. Just time for our last walk up the hill and back to the hotel before heading to the airport and home. Not much history obvious to the eye with information or signing available to all. So when was the war, what happened etc. Are they trying to hide it away? Longer than a couple of days city break – hire a car and see more of Croatia. Take a planned guided history tour OR a multitude of reading before hand to understand the history of the City.